Think of springtime plants and it’s often daffodils and tulips that come to mind. But there’s more options out there if you are looking to add some springtime interest to your garden. Here’s some plants that offer interesting features through early to late spring here in the Vancouver region. Interesting features come from more than just flowers; leaves, bark and branches can offer colour, texture and shape to the garden while the perennials are still getting started. 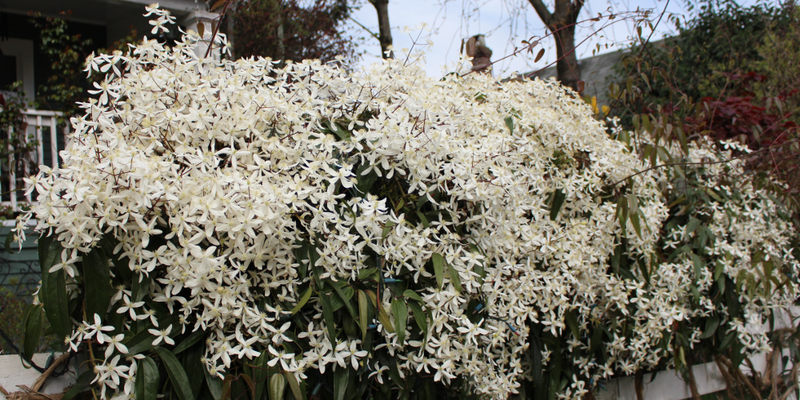 Clematis armandii is an evergreen climber with beautifully scented white, star-shaped flowers in early spring (these photos were taken in mid-March 2015). The new foliage is bronze, which contrasts nicely with the white flowers. 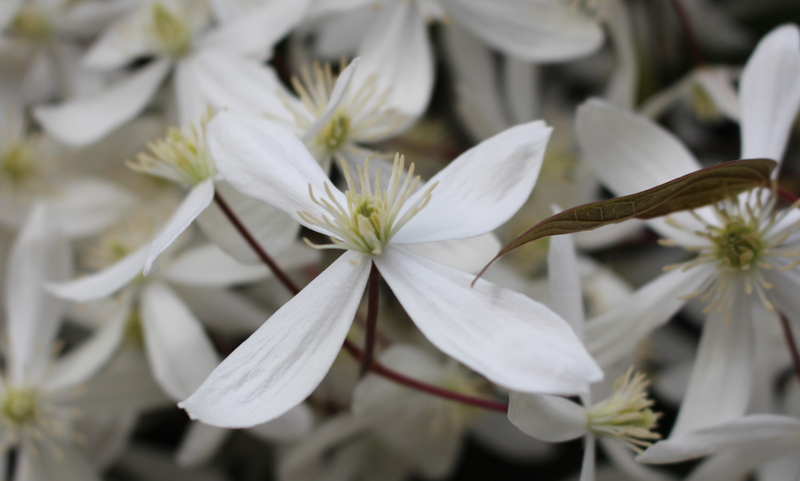 This clematis can become very big, so plant it in a spot where it has plenty of room to grow. 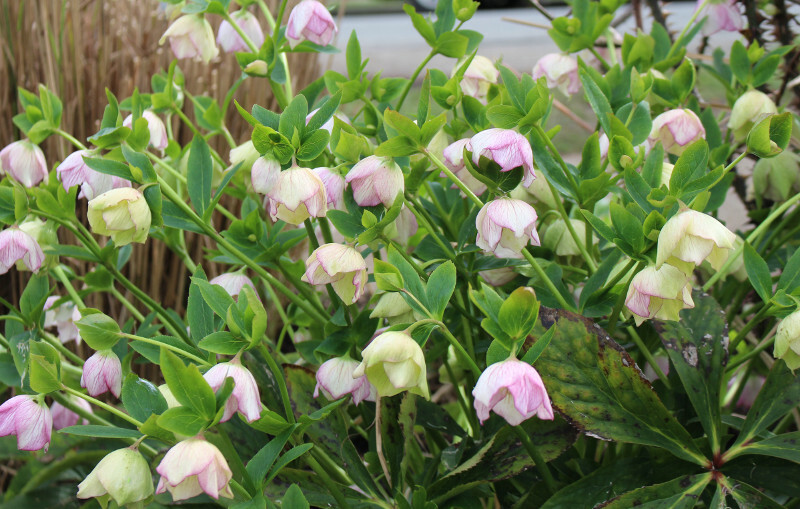 Hellebores actually appear in winter, but the long-lasting blooms look good well into spring. The flowers look like hanging heads and can be seen best when the large leaves from the previous year’s growth are removed. The flowers come in shades from white, pink, green, and purple. Hellebores prefer shade, and combine nicely with other woodland plants such as ferns and hostas. Dicentra spectabilis (common name, Bleeding Heart) is a common woodland plant. It has pink and white heart-shaped flowers on arching stems in April and May. These pictures were taken in March 2015, a very early spring after a mild winter in Vancouver. The two lower pictures are the golden leaf variety of Bleeding Heart: Dicentra spectabilis ‘Goldheart’. The acidic green foliage is much more vibrant than the straight green-leafed variety (shown in the first picture) and makes quite an impact against the pink flower. 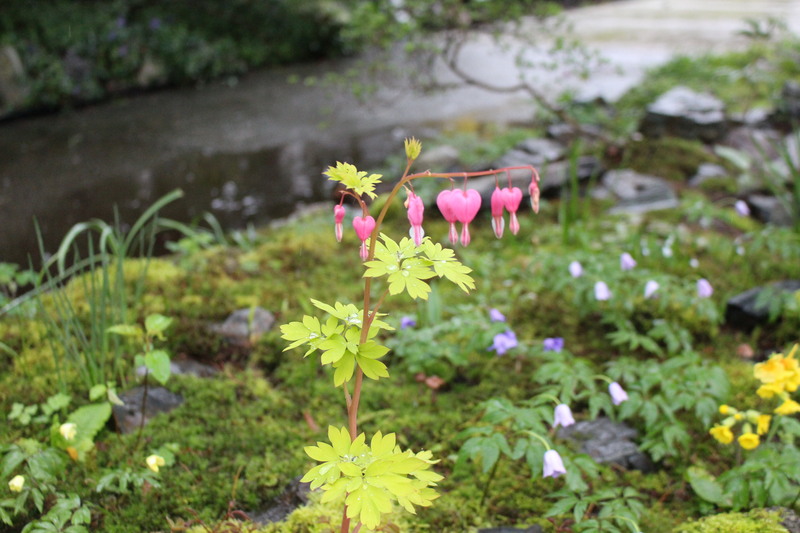 As a woodland plant, bleeding heart prefers light to open shade. It goes dormant in summer. These are the white flowers of Ribes sanguineum ‘White Icicle’, a cultivar of our native, pink-flowering Ribes sanguineum here in BC. This shrub can get big: up to two meters. Once established it is drought tolerant. The flowers attract bees and the black-blue berries attract snackers in summer. Blooms best in full sun. Pieris can be a bit of a love it or hate it shrub. It’s a very common shrub here in Vancouver, and unfortunately is often recognised as the shrub with all that black mould growing on the leaves in spring (which is easily treatable, click here to find out more). Despite that, the new growth on Pieris can really put on a stunning display, with leaves in colours from soft yellow, peach through to vibrant. It has strings of pearl-like flowers in spring, in whites reds or pinks depending on the variety. The flowers are an important food source for our native pollinator, the Mason Bee. 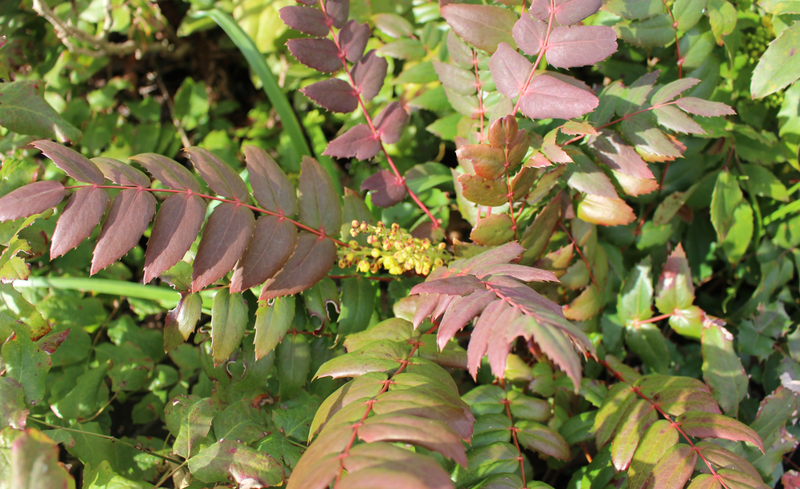 Mahonia nervosa (creeping Oregon Grape) is a Pacific Northwest native plant. Its new growth is tinged with soft reds when grown in full sun (as in the picture opposite). In deeper shade, its emerald leaves contrast with bright yellow leaves in late spring, and deep blue berries in fall. It will grow in tough sites, in full-sun to deep shade and is drought tolerant when established (my kind of plant!). 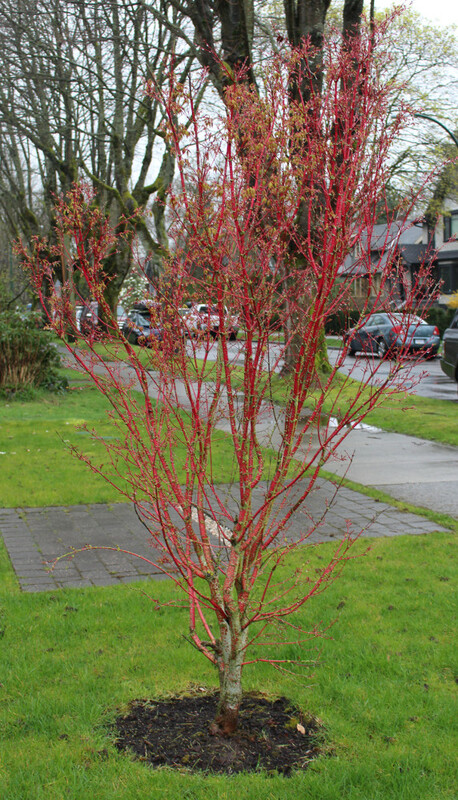 This Coral bark maple (Acer palmatum ‘Sango Kaku’) is a beautiful choice for a specimen tree here in the Vancouver area. It has fantastic coral-coloured branches in winter, followed by deeply cut light leaves that turn golden in fall. A great choice for winter interest in a garden. Solomon’s seal (Polygonatum odoratum) is a great choice for a shady garden. Year after year its beautiful arching steps have small white, bell-shaped flowers in the spring. Even in tough growing conditions, Solomon’s seal looks elegant from the time that it appears. In fall, the leaves turn a translucent yellow and will stay in place until several frosts allow them to be removed with a gentle tug (making for an easy clean-up). Need some help designing or installing your spring interest garden? Contact us at Growing in the Garden.